Chronic inflammation in the brain is thought to be one of the major mechanisms underlying the precipitous atrophy and cognitive decline seen in Alzheimer's disease (AD). Thus, there is a compelling need to better understand the beneficial and adverse effects of inflammation in aging brains across the AD spectrum. In particular, it is important to examine many biological markers of inflammation and to determine which markers are most relevant to AD-related atrophy and memory decline. These investigations might then guide more targeted drug and nondrug therapies to slow atrophy and memory decline. This approach may be more beneficial than using NSAIDs, which have shown mixed results in basic research and clinical trials. In unpublished work, I collected publicly available data from the Alzheimer's Disease Neuro Imaging Initiative (ADNI). This longitudinal, observational study is dedicated to understanding the etiology of AD.3 ADNI collects neuropsychological, imaging, and biofluid data on cognitively normal, mildly cognitively impaired, and AD participants. 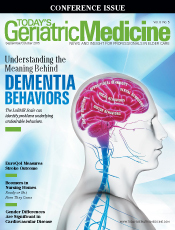 Mild cognitive impairment (MCI) is largely considered the precursor state of AD, characterized by significant memory loss but not deficits in activities of daily living, other cognitive domains, or other AD criteria. Among 85 cognitively normal, 134 mildly cognitively impaired, and 66 AD participants, I examined memory function, global cognition, and medial temporal lobe atrophy both at baseline and at several time points up to 36 months later. For biological markers of inflammation, I used cerebrospinal fluid inflammatory peptides derived by mass spectrometry from the ADNI Biomarker Core at baseline.4 The medial temporal lobe was chosen because it contains the hippocampus, is integral for learning and memory, and strongly tracks AD progression.5 Mass spectrometry data were not available beyond baseline. Only nine inflammatory peptide markers were expressed in most or all participants. I believed it was important to focus only on biomarkers with consistently detectable levels, as many cytokines, chemokines, and tumor necrosis factors can be difficult to assay due to low concentrations. Statistical analysis was used to determine which markers would best predict medial temporal lobe atrophy and a memory decline factor one or two years later relative to baseline. The strength of these associations was then tested, as well as interactions with known AD risk factors. This ongoing work is conducted in conjunction with Ashley Swanson, a graduate student in my laboratory. There was a stepwise modest decrease in NPTX2 from cognitively normal to AD participants, as well as MCI progressors to AD compared with nonprogressors. These results suggest a decreased ability for the medial temporal lobe to create new synapses because of the disease. YKL-40 showed similar modest increases, in keeping with the idea that microglial activation increases across the AD spectrum. I initially believed that YKL-40 would be a much more potent predictor of brain atrophy and memory decline over time than NPTX2. That belief proved to be mistaken. Higher NPTX2 was a potent predictor of less brain atrophy and better memory performance. These associations were highly significant and consistent across time. By 24 months, NPTX2 predicted 53% of the variance in memory function and 30% of the variance in medial temporal lobe atrophy. Participants with the highest NPTX2 levels at baseline showed no atrophy or memory decline. This effect seems to occur only in mildly cognitively impaired and AD participants. Participants with one or more copies of the Apolipoprotein epsilon 4 allele, a strong genetic risk factor for AD, did not show these beneficial associations with NPTX2. Two scenarios may explain these findings. NPTX2 could be a causal factor that induces or maintains synaptic plasticity in AD, leading to less memory decline and atrophy of synapses themselves or perhaps neurons additionally. Another explanation is that NPTX2 is correlational in nature and not a direct causal agent. That is, NPTX2 may be downstream of another process, such as neurotrophic factors, that actually prevents atrophy and memory decline. Higher YKL-40, conversely, predicted more medial temporal atrophy and worse memory performance across time, as anticipated. However, these associations were unusually modest. By month 24, YKL-40 levels predicted only 6% of atrophy variance and 4% of memory variance. These modest associations did not statistically vary as a function of baseline diagnosis, genetic status, or other factors. These results suggest that microglial activation, and subsequent proinflammatory cascades, may play a more limited role in medial temporal atrophy and memory decline in those with at least MCI and early AD. The biggest takeaway message is that "good" inflammation may be a much more important process to track and understand than "bad" inflammation in AD. It should be noted that this study was cross-sectional in nature and causal attribution cannot be inferred. It is also important to emphasize that this work has not been formally peer-reviewed. Improvements to clinical care should encompass controlling obesity and encouraging mentally rigorous activities. Reducing body weight in obese patients is a critical and currently underappreciated intervention that deserves serious consideration. Obesity is known to increase AD risk through a variety of mechanisms, including insulin resistance and chronic inflammation in the aging brain. Increased adiposity in the gut and peripheral inflammation can cause chronic inflammation in the brain. Obesity is generally related to medial temporal lobe atrophy and worse memory performance in normally aging adults.7 It is conceivable that obesity increases "bad" inflammation while decreasing "good" inflammation. A high-fat diet in rodents, for example, impairs synaptic plasticity,8 possibly by driving down NPTX2 levels. For weight loss or maintenance, intermittent calorie restriction (CR) is effective regardless of age. Mark P. Mattson, senior investigator chief in the Laboratory of Neurosciences and chief of the Cellular and Molecular Neurosciences Section at the National Institute on Aging, and others have recently described "5-2 CR," in which participants severely restrict calories to 600 kcal on two consecutive days, followed by five days of unrestricted eating. This approach reliably reduces body weight and insulin resistance, as well as markers of inflammation and oxidative damage that can impact the brain. Intermittent CR also has a substantially higher compliance rate than daily or alternate day restriction. This may be attributed to participants' ability to engage in eating practices with friends and family that form a central role in American culture. Another potential though less validated dietary approach is a ketogenic diet. Kashiwaya et al9 examined transgenic mice that develop amyloid and tau pathologies similar to AD, as well as exhibiting cognitive deficits. They found that animals on a ketone body vs isocaloric carbohydrate diet showed less AD pathology in the hippocampus and better cognitive performance. While exercise recommendations often fall on deaf ears, emphasizing moderate approaches as well as the immediate and long-term benefits on the brain may increase compliance. Moderate exercise, defined as 30 minutes per day on at least three days per week, is as simple as taking slightly brisk walks, standing up to walk around after prolonged periods at a desk, or other casual activities. Some studies suggest that an emphasis on going to the gym or other time- and resource-intensive specialized fitness activities actually act as substantial barriers to basic fitness. In the immediate and short term, it is well established that exercise significantly improves mood and affect, as well as executive function and other cognitive processes, regardless of body weight. While it is unclear whether these effects may be in part due to NPTX2, systemic inflammation generally is reduced. As systemic and brain inflammation are linked, it is conceivable that exercise reduces microglial activity and some of the negative effects associated with it. In the long term, in overweight MCI patients, exercise reduces biomarkers of chronic inflammation, raises brain trophic factors that promote repair and synaptic plasticity, and improves cognition.10 Thus, exercising without necessarily inducing weight loss may itself have protective effects against AD in the brain. It remains to be seen whether weight loss or exercise in late middle age is protective against MCI or AD. Given how strongly NPTX2 reflects optimal neural and memory outcomes, it may be worthwhile to encourage activities that bolster synaptic activity. A leading example in the AD literature is cognitive reserve. Cognitive reserve is the phenomenon whereby individuals with more years of education, mentally intensive professional jobs, or other active mental pursuits appear to be less prone to AD effects given the same degree of AD pathology. Contrary to preventing memory impaired individuals from performing tasks because of a lack of patience or empathy, caregivers should instead encourage patients to maintain proficiency in daily tasks, socialize, and above all remain mentally active. I am very keenly interested in whether such interventions correspond to more NPTX2 in the brain. If so, NPTX2 may provide a biological marker for cognitive reserve and help it gain more legitimacy in the medical community. In closing, the role of the immune system in the brain is intensely complicated. Consideration must be given not only to both "bad" and "good" aspects of inflammation but also to a focused appreciation of exact biomarkers that track AD pathology and memory outcomes. While my recommendations are purely speculative in nature, I'm hopeful that future work in rodent models of AD may corroborate my findings on NPTX2. — Auriel A. Willette, MS, PhD, is a researcher in the department of food science and human nutrition, as well as the neuroscience graduate program at Iowa State University in Ames, Iowa. — Ashley Swanson is a graduate student working in Willette's laboratory in the department of food science and human nutrition at Iowa State University. 1. Ross FM, Allan SM, Rothwell NJ, Verkhratsky A. A dual role for interleukin-1 in LTP in mouse hippocampal slices. J Neuroimmunol. 2003;144(1-2):61-67. 2. del Rey A, Balschun D, Wetzel W, Randolf A, Besedovsky HO. A cytokine network involving brain-borne IL-1beta, IL-1ra, IL-18, IL-6, and TNFalpha operates during long-term potentiation and learning. Brain Behav Immun. 2013;33:15-23. 3. Weiner MW, Veitch DP, Aisen PS, et al. 2014 Update of the Alzheimer's Disease Neuroimaging Initiative: a review of papers published since its inception. Alzheimers Dement. 2015;11(6):e1-e120. 4. Spellman DS, Wildsmith KR, Honigberg LA, et al. Development and evaluation of a multiplexed mass spectrometry based assay for measuring candidate peptide biomarkers in Alzheimer's Disease Neuroimaging Initiative (ADNI) CSF. Proteomics Clin Appl. 2015;9(7-8):715-731. 5. Fayed N, Modrego PJ, Salinas GR, Gazulla J. Magnetic resonance imaging based clinical research in Alzheimer's disease. J Alzheimers Dis. 2012;31(Suppl 3):S5-18. 6. Heneka MT, Carson MJ, El Khoury J, et al. Neuroinflammation in Alzheimer's disease. Lancet Neurol. 2015;14(4):388-405. 7. Willette AA, Kapogiannis D. Does the brain shrink as the waist expands? Ageing Res Rev. 2015;20:86-97. 8. Liu Z, Patil IY, Jiang T, et al. High-fat diet induces hepatic insulin resistance and impairment of synaptic plasticity. PLoS One. 2015;10(5):e0128274. 9. Kashiwaya Y, Bergman C, Lee JH, et al. A ketone ester diet exhibits anxiolytic and cognition-sparing properties, and lessens amyloid and tau pathologies in a mouse model of Alzheimer's disease. Neurobiol Aging. 2013;34(6):1530-1539. 10. Nascimento CM, Pereira JR, de Andrade LP, et al. Physical exercise in MCI elderly promotes reduction of pro-inflammatory cytokines and improvements on cognition and BDNF peripheral levels. Curr Alzheimer Res. 2014;11(8):799-805.